We’ve been talking about cooking pizza on the barbecue this for what seems like forever and yesterday we finally got around to it. 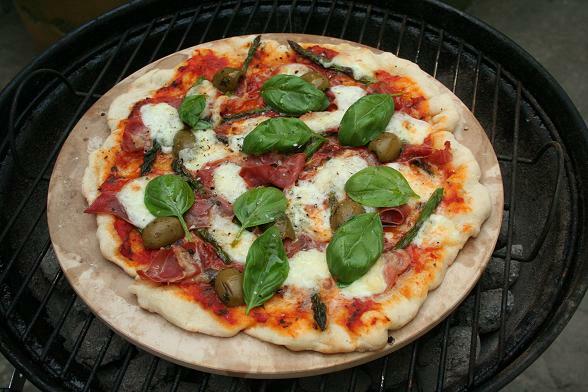 We don’t have the space for a pizza oven in our garden and, after some lengthy research, it would appear that barbecuing pizza is the next best thing. The charcoal can be heated to a much higher temperature than a domestic oven and is therefore ideal for the short and hot cooking times needed for perfect pizza. We opted for asparagus and proscuitto as our toppings, along with some olives and some buffalo mozarella. During my research I noted that San Marzano tomatoes are widely believed to be the best variety of canned tomatoes and luckily, I was able to find some at Whole Foods. We usually just cook down some cherry tomatoes to use as a tomato sauce for topping pizza but the canned tomatoes worked well, they were probably better in fact: fry off some garlic, add the tomatoes and some herbs (we used oregano) and cook down for 5 minutes. Five minutes may seem short but the sauce was fresh and didn’t have that stewed flavour that cooked tomatoes can have. The lightness of the sauce was a good thing as the other flavours were strong and needed something to balance them. We were pleased with the result, the pizza was light and crispy and the flavours were well integrated; much better than the pizza we’ve made in the oven before. We left the coals for too long before adding the stone though which meant the temperature dropped and the pizza cooked for longer than is ideal. I’m hoping that if we get the pizza onto the barbecue sooner then it will cook through in just a few minutes and create blistered, crackled edges. Subscribe to comments with RSS	or TrackBack to 'Asparagus and Proscuitto Pizza'. Looks fantastic. We had a play with “Cassius” (our clay oven) this weekend and instead of pizzas we roasted some lamb which was delicious. Did you get a nice smokey quality to the pizza? I bet it was delicious. I’m going to have to get my hands on some San Marzano tomatoes and make some soudough! I’m a bit wary of the stone cracking at a higher heat, GSD, but I guess there’s only one way to find out! The lamb sounds fantastic, Jonathan. There was a smokey flavour to the pizza but I’m hoping that will increase with a higher heat. I just found your site via Tastespotting.com. Your pizza looks awesome, great photo. I will definitely have to try your simple recipe for tomato sauce. I always want to make my own but I usually just spice up some canned sauce. What a fanastic idea?! I have a baking stone, but have never contemplated using it on a bbq! I just might! Buffalo Mozzarela is the only way to go on any pizza! Content and Images Copyright © 2009 Dinner Diary.